Noticing signs of stress can be extremely important for cattle owners, as those signs can be the beginning of a much bigger problem, such as anaplasmosis. Anaplasmosis is a disease of cattle is caused by a bacteria that can be transmitted by ticks, horseflies or blood contaminated equipment like needles. Good animal husbandry is having an understanding of what the animal needs on a day-to-day basis. For cattle, that can mean finding ways to reduce stress, such as good forage, easily accessible and clean water, and shade. Anaplasmosis can act quickly and the first signs cattle owners may see is a few dead adult cows in their herd. Craig Payne will go into more details about anaplasmosis during the Wurdack Research Center field … Expand ▸Craig Payne will go into more details about anaplasmosis during the Wurdack Research Center field day, which will take place on Friday, Oct. 5, at the Center near Cook Station. Registration for the field day begins at 8:30 a.m. with wagon tours running from 9 a.m. to noon. A lunch, sponsored by FCNB Bank, will be served at noon. The event and meal are free and open to the public. “The number of red blood cells infected doubles every day,” Payne said. One day a cow may appear a little off. A day or two later, she may be dead or so far gone that she does not respond to treatment. Fall is when anaplasmosis is most likely to occur, so Payne encourages producers to be on the lookout for subtle signs of the disease at this time of year. The primary method for controlling anaplasmosis is feeding chlortetracycline, an antibiotic, from early summer through late fall. This is when tick and horsefly populations are present and transmission is most likely to occur. An animal that has been diagnosed with anaplasmosis is often treated with injectable oxytetracycline. Even though oxytetracycline is available over-the-counter, it is not labeled for treatment of this disease and requires a veterinary prescription before using it in that manner. Ticks are considered to be the most efficient transmitter of anaplasmosis. Horseflies can be a transmitter as well, and Payne added that recently they have been made aware of the increased risk of spreading the disease through contaminated needles. Payne added that anaplasmosis is widely distributed throughout Missouri. 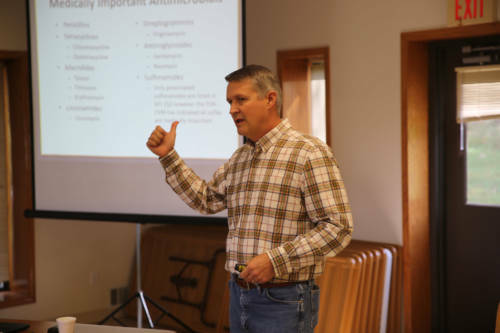 Payne will go into more details about anaplasmosis during the Wurdack Research Center field day, which will take place on Friday, Oct. 5, at the Center near Cook Station. Registration for the field day begins at 8:30 a.m. with wagon tours running from 9 a.m. to noon. A lunch, sponsored by FCNB Bank, will be served at noon. The event and meal are free and open to the public.